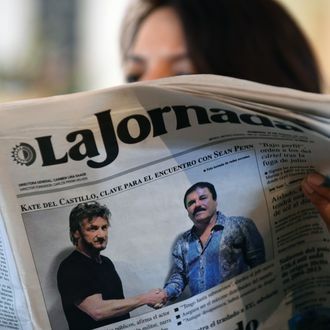 Following the revelation on Saturday night that actor Sean Penn had met and interviewed Mexican drug kingpin Joaquín Guzmán Loera for Rolling Stone last fall, Mexican authorities have now indicated that yes, that meeting, which Penn set up with the help of popular Mexican actress Kate del Castillo, was what helped them locate Guzmán. Months later, the cartel leader, known as El Chapo, was eventually apprehended following a deadly shootout on Friday. Reuters reports that two senior Mexican government sources said they were aware of the October meeting, and were able to monitor Guzmán’s movements afterwards. The meeting and interview were an indirect result of El Chapo’s wish to have a biopic made about his life, a project he started while still incarcerated and then sought to continue, with Ms. del Castillo in charge, following his escape from the maximum-security Altiplano Prison six months ago. While the interview led law enforcement forces to El Chapo, they did not try to seize him right away, apparently because of a risk of collateral damage. Later, however, they launched an assault on Guzmán’s ranch using helicopter gunships. After a days-long battle, El Chapo eventually escaped from the location with just a minor injury to his leg. 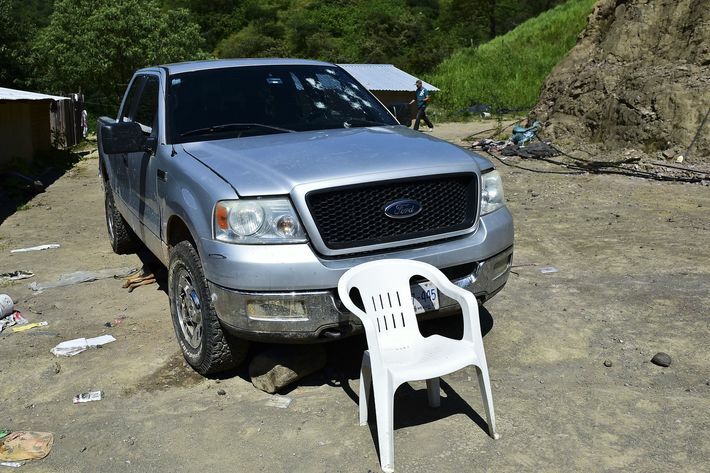 It seems that following this breakthrough in the manhunt, Mexican authorities were put on the path to eventually recapturing the two-time prison escapee, which they did on Friday morning in the Pacific Coast city of Los Mochis. Mexican authorities have since returned him to Altiplano prison, and have announced that the drug lord will face hearings for possible extradition to the U.S., though whether the extradition will be approved remains to be seen. Reuters also reports that the Mexican government may be considering an investigation of Penn and del Castillo as a result of their involvement with Guzmán. Rolling Stone published the 11,000-word interview, which was conducted and written by Penn, on Saturday. In the piece, Penn acknowledges that he understood the meeting and his related communications and movements were likely being tracked by DEA and Mexican authorities, despite the painstaking precautions he was made to take by Guzmán’s representatives while pursuing and eventually traveling to Mexico for what became only one in-person meeting with El Chapo. Unable to meet the cartel leader again, Penn conducted the actual interview via recorded videos. On Friday, Mexico’s attorney general had reported that it was El Chapo’s desire to produce a biopic about his life that helped authorities recapture him, as they were able to find him by surveilling his associates as they worked on the film effort. Del Castillo — a popular Mexican soap opera star who once played the role of a drug kingpin herself — had tweeted complimentary statements about Guzmán in the past, as well as expressed her distrust of the Mexican government — comments that caught the drug lord’s attention. He eventually reached out to her while he was in prison. According to Penn’s interview, El Chapo said that del Castillo was the only person in the world that he trusted to lead the biopic project, and he had originally sought her assistance after being overwhelmed with Hollywood offers the first time he was caught and re-imprisoned in 2014. While looking into the project, she partnered with one of Penn’s associates to produce the film, but the project became stalled until after Guzmán escaped from prison in July. Okay, But Who Will Play Sean Penn in the El Chapo Biopic? There is no question in my mind but that the DEA and the Mexican government are tracking our movements. From the moment Kate had gone out on a limb with her tweet of January 2012 through the beginning of our encrypted negotiations to meet El Chapo, I had been bewildered by his willingness to risk our visit.